Steven is the husband of his beautiful wife Lisa, who he married in 1995. He is the father of four children: Morgan, Nathan, Casey, and Micah. Pastor Parker is passionate about building community in the kingdom of God: worshiping Christ together with God’s people, developing a sense of spiritual kinship among diverse people, and ministering alongside others to serve “the least of these” in the name of Jesus. 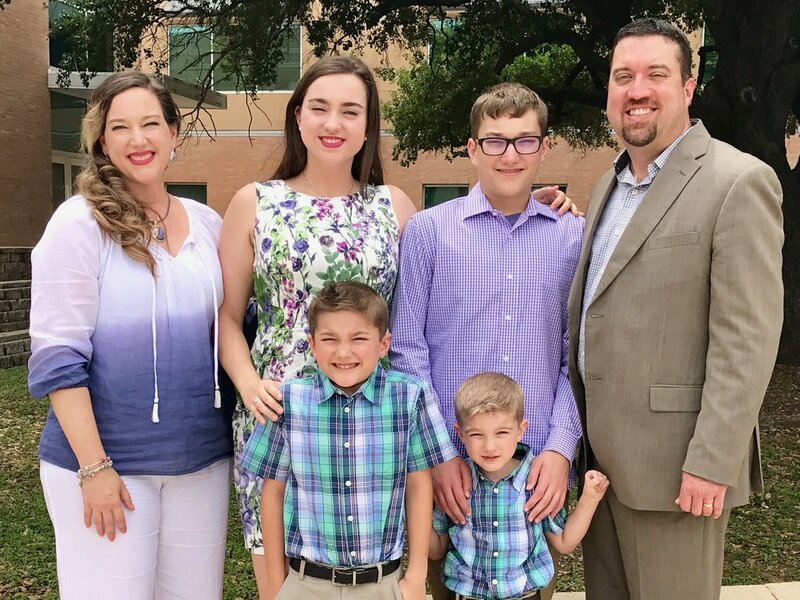 Steven and Lisa Parker are Rio Grande Valley natives and were high school sweethearts, graduating from Lyford High School together in 1994. The Parkers now enjoy sharing Lowery Dyer’s famous chocolate pie and binge watching their DVR programs and favorite Netflix shows. The Parker family loves the Dallas Cowboys and the San Antonio Spurs. Pastor Parker is the second longest tenured pastor in the history of First Baptist Church Weslaco. The Parkers are active in Weslaco and throughout the Mid Valley. They serve together on the Rio Grande Valley Livestock Show Gala Committee and Lisa is a member of the Hidalgo County 4-H Foundation Board for youth scholarships. They can often be found cheering at little league games, swim meets, and other local sporting events. Steven’s favorite pastime is his work establishing their small backyard rabbitry, raising meat pen bunnies for his kids’ livestock show projects.